Aquaman was a winner at San Diego Comic-Con 2018. The full trailer was revealed at last, and those actually in attendance for the Warner Bros. panel in Hall H got to see extra footage featuring Jason Momoa’s Arthur Curry sporting the classic yellow and green Auaman costume. 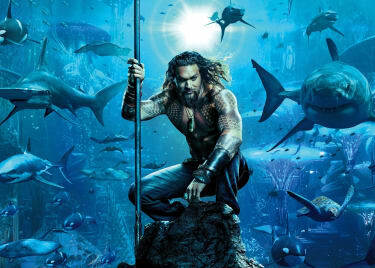 According to Twitter, Aquaman beat all competition on social media to become the most-discussed film of SDCC, with more tweets dissecting the footage than seen for any other film. (Another Warner Bros. film, Fantastic Beasts: The Crimes of Grindelwald generating intense discussion as well.) 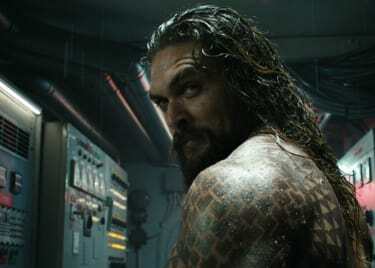 Here are 8 big takeaways from the Aquaman trailer. First up, we have Aquaman‘s remarkably comic-book-accurate origin story. Lighthouse keeper Tom Curry (Temuera Morrison) discovers Atlanna, Queen of Atlantis, washed up on the shore after a storm. Over the course of the next few years, Tom cares for the injured Atlanna (Nicole Kidman), helping her to recover. The two fall in love, and have a child, Arthur. This is lifted straight from the comics, but notice that there are no glimpses of Atlanna after this sequence. 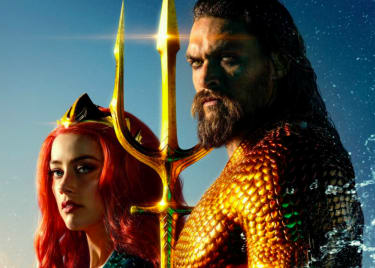 In set visit reports that went online just before the trailer drop, Warner Bros. revealed she is taken back to Atlantis and judged for the “crime” of liaising with a surface-dweller. Arthur believes she’s executed for this. So he grows up with a deep hatred of Atlantis, and has never been there before the film begins. This is perhaps the most entertaining sequence in the trailer, and one with serious meta-awareness. Aquaman is among DC’s most derided superheroes, with powers that are often dismissed as a joke. As Bruce Wayne deadpanned in Justice League, “I hear you can talk to fish.” Here we see that ability is pretty powerful. Bullies are terrified when creatures of the sea come to young Arthur’s defense. It’s a first hint at Arthur’s power, and even his regal nature. Notice the artistic crack in the glass, a first hint that barriers between the surface world and creatures of the deep will break down. This is one of the key scenes in the film. When Mera (Amber Heard) first comes to Arthur Curry, seeking his help against the warlike King Orm (Patrick Wilson), Arthur refuses. He doesn’t see why he should get involved in Atlantean affairs; it’s not like he’s welcome as a half-breed. But Orm doesn’t know that Arthur isn’t a threat, and tosses a destructive tidal wave at Amnesty Bay. Arthur’s father almost dies in the attack, and Arthur realizes there’s no way he can sit this one out. He’s going to have to fight. At last, Atlantis! This is Arthur Curry’s first glimpse of the legendary city. The design suggests an entire civilization perfectly in tune with nature. Buildings seem to be built around the coral reefs, while Atlantean vessels, such as the one Mera is piloting, look organic and almost like fish. Unfortunately, Atlantis’s relationship with the natural world is leading the civilization into crisis. Pollution from the surface, accompanied by the impact of global warming, is killing the reefs that are the city’s foundation. Orm’s argument is that declaring war on the surface is essentially a matter of survival; victory will ensure their civilization doesn’t fall. This scene is much-discussed in set visit reports, suggesting it is important to director James Wan. Aquaman challenges Orm to ritual combat in order to claim the throne of Atlantis. The two battle in what seems to be a volcanic collapse pit, suggesting Atlantis is situated near one of the Mid-Oceanic Ridges. The environment is inhospitable, with lava flows raising the sea temperatures and flooding the water with toxic gases. Fortunately, Atlanteans are hardy. Your average Atlantean is only a little below a Kryptonian in terms of power level, although their powers weaken when they’re out of the water. The Trench are the most dangerous and brutal of the seven tribes of Atlantis. Their bodies have evolved to survive the depths of the Marianas Trench. They also appear to be the film’s main villains. In this scene the Trench have launched an attack upon a ship, aiming to kill and eat all aboard. Aquaman appears to use some sort of flare or beacon to draw the Trench towards him and Mera. James Wan is traditionally a horror director, and this scene shows him playing to that strength. Although Black Manta isn’t the main villain of Aquaman, he’s an important character. 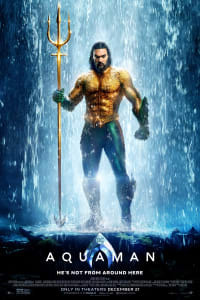 A pirate who blames Arthur Curry for the death of his father, Black Manta allies with King Orm and becomes the King’s greatest weapon against Aquaman and Mera. This movie is essentially an origin story for Black Manta, with actor Yahya Abdul-Mateen II signed up for a multi-picture deal. In one stunning scene, Black Manta launches devastating energy attacks upon Aquaman, forcing the hero to run for his life. Naturally, it all comes down to a massive battle between the tribes who follow Orm – including the Trench – and those who’ll oppose him. This is a spectacular scene, suggesting that the film will show unique fighting styles for each of the seven tribes we see in action. With the tribes turning against one another, it will be down to Aquaman to find a way to claim the throne, and thus unite Atlantis once again. Aquaman opens on December 21.